Books 1-6 of my New York Times and USAToday Best Selling series, The Alliance. Discover what happens when Earth receives its first contact! To buy each individual book or audiobook, click HERE to go to The Alliance series page. Four years ago, Earth received its first visitors from space, and the planet was thrown into a panicked chaos. The Trivators came to bring Earth into the Alliance of Star Systems, but now they are forced to take control of Earth to prevent the humans from destroying it in their fear. 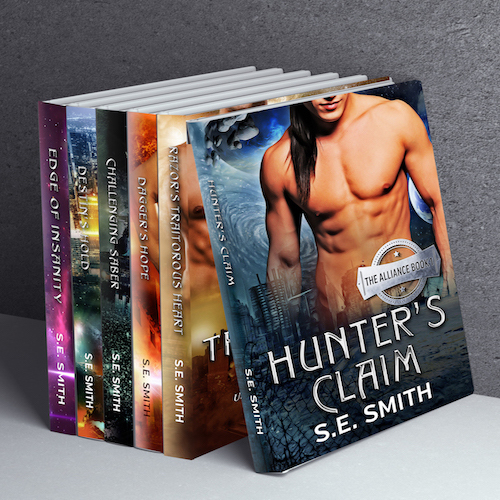 Hunter's Claim: USA Today Bestseller! Jesse and her two younger sisters, Jordan and Taylor, have seen the savage side of human nature and found that humans are not much different from the aliens who conquered Earth. When Jesse stumbles on an alien in danger, however, she can't leave him to his fate. She escapes his grasp once she frees him, but he is determined to find her and give her a new life, away from this war-torn planet. Razor's Traitorous Heart: The Alliance is out of patience with the violent hysterics of the Earthlings. Razor has been sent to bring order – by any means necessary. Chicago's factions are proving difficult to quell, and Razor is beginning to think that leveling the city may be his only option, but when a shadow warrior saves his life and disappears, Razor finds himself torn between duty and something he is unfamiliar with, his heart. Dagger's Hope: USA Today Bestseller! New York Times Bestseller! When they first met, Dagger saved Jordan's life. Now it's her turn to save him, no matter the risk. She'll cross the galaxy alone if she has to. Edge of Insanity: USA Today Bestseller! Dagger was rescued, but Edge was presumed dead.... A human woman caught on an alien world will do anything to get back to Earth, even if it means freeing a Trivator. Hunter straightened up to his full height and looked down at Jesse with a fierce, possessive look. He could sense her unease and growing fear. There was nothing he could do about it. He would not lie to her. The sooner she accepted that she belonged to him, the better for them all. He would be leaving in less than two weeks to return his world as his tour of duty was up and Jesse and her sisters would be returning with him. Shock held Jesse frozen. Her mind rebeling against what he was telling her. Her eyes swept over the huge alien standing over her. She had never felt so small or defenseless in her life. There was only one thing that she could think of as his words sank in. She had to accomplish one thing as soon as was humanly possible. We have to escape, she thought as horror seized her in its ugly grip. Now!